Mention the name of the great Jimi Hendrix and what instrument comes to mind? A guitar certainly, but not a cello. So what happens when you perform some of Hendrix’s masterpieces with an instrument generally associated with chamber music and orchestras? In a music video produced last month in Athens, Greek cellist Fernando Nina takes Hendrix’s “Purple haze” and blends it with contemporary dance, street art and Hendrix’s own aesthetic. 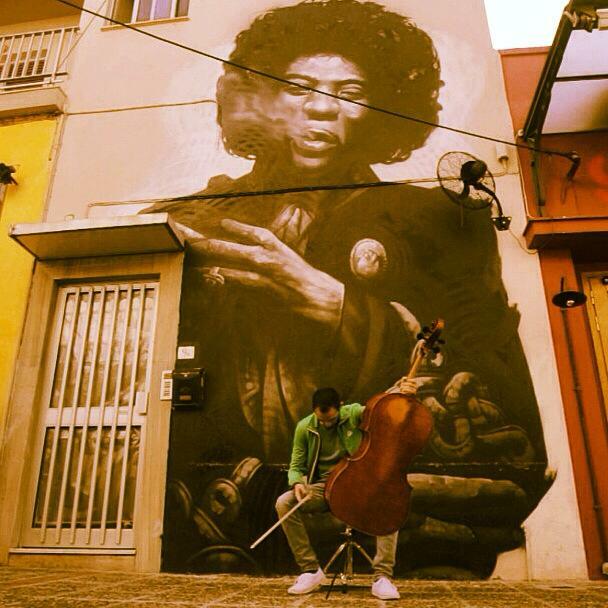 Entitled “Cello haze”, the video, which also features modern dancer Foteini Passa, was shot on Nea Smyrna Square and in Halandri in front of a mural depicting Hendrix, by street artist Insane 51, at the 9vita Home Bar. Currently studying in Germany, Fernando (25) has won more than a dozen prizes at international music competitions and has been an Onassis Foundation scholar since 2012.